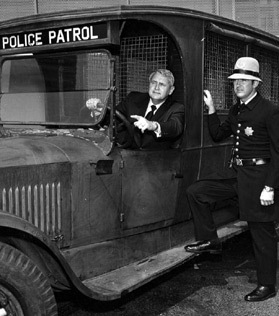 Chiefs of Police focused the eyes of law enforcement on Los Angeles, and Russ was here to help. Michael Connelly, a best selling author of crime novels supports law enforcement through his writing. And finally, one of our very own residents, and long standing supporters of law enforcement in general and the LAPD specifically, Johnny Grant. His commitment to the Department is now decades old. Anyone who has visited Hollywood has seen his work on the walk of fame. Anyone who has visited Hollywood station should know Johnny was responsible for the stars that memorialize those we have lost serving the people of Hollywood. With such a great list of honorees, the historical society is looking forward to this event with great anticipation. We are hoping you can join us at the Sheraton Universal on the ninth of September. Before there is any discussion about just what is going on at the historical society, it’s necessary to tie up some loose ends from the last issue of the Hot Sheet. The photo that graced the cover of the last edition featured President John F. Kennedy shaking hands with Chief William H. Parker. To Kennedy’s side was an onlooker, complete with suit, tie and hat, seemingly admiring the President. 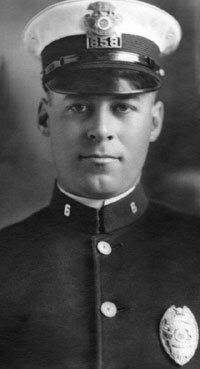 For those that recall the accompanying story, our curiosity had to do with who this was, and why the Chief asked to have his likeness removed from the photo. While we may not have the complete story, and arguably may never get it, there does seem to be some consensus as to the identity of the man in close proximity to the President. This man was, in fact, constantly in close proximity to the President. They were the closest of friends. David Powers met Kennedy as a young campaign worker during Kennedy’s first run for congress. During the Kennedy Presidency, Powers was a Special Assistant to the President. After the assassination of JFK, Powers went on to serve as the director of the John F. Kennedy Foundation. Dear friends, indeed, as reflected by this black and white image. Now, as to what we have been doing, and what we have planned here, suffice it to say, we have been busy. Police Memorial Week falls during the week of May each year. With the removal of the monument at Parker Center, the memorial ceremony, too was relocated. This year, the ceremony was held on the field at the Elysian Park academy. Truly a fine setting for this moving event. The historical society was there to support our honored lost through displays of photographs and vehicles. We salute the organizers for all of their efforts who arranged this new and fitting tribute. The EAU staff all deserve our thanks, with a particular nod of gratitude for Steve Hillmann who ensured the transition to a new venue was smooth and effective. As we prepared for the memorial week services, we identified another means of supporting those we have lost. As described, the annual ceremony honors the fallen in the real world. The ceremony is a very visual salute replete with all the traditions of a military funeral. Once memorial week has passed, however, the real world opportunities give way to the virtual world. Information on slain officers is available in a number of locations, most notably the Department website at lapdonline.org. Starting with memorial week, and as information becomes available, we are supporting the Department and those we have lost by providing photographs and information to update the website. While supporting both the website and the memorial ceremony, we pulled three portraits from our archives to digitally reproduce. All three were from 1924, one of our deadliest years. The roaring twenties did indeed roar. It was a tragic year for the Department. Twelve officers were slain in California, nearly half were Los Angeles Police Officers. Glenn E. Bond, Frank E. Corley, Ralph D. Green, George E. Papst and Edward E. Wilhoit, all perished, some to gunfire, some to traffic accidents. Portraits of four of these five have been provided to the Department to assist with the development of their website. that was handled sensitively and adroitly by one of our tenured reserve officers. On to what is happening in the near future. 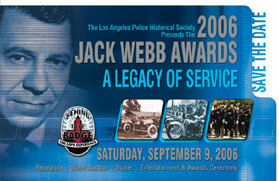 As the front cover shows, it is that time of year when we are busily gearing up for the annual Jack Webb Awards. With just a few months to go, this promises to be one of our most interesting and eventful events. Around the same time, we plan to be displaying our wares at the Los Angeles County Fair. Through their generosity, we plan on taking advantage of some donated display space where we can exhibit a vehicle or two and promote the museum. This is a truly unique opportunity that has come our way through contacts in the museum community. It is our hope to have one of our new acquisitions, the Peacekeeper, on display for the public to enjoy. The City Council recently approved the donation of the Peacekeeper to the museum, so plan on seeing this retired armored vehicle on display at the museum in the very near future. For any of you who have an interest in history and are enjoying retirement, we have a position available for someone who is willing to work fulltime, including some nights and weekends and has considerable LAPD experience. If you fit the bill, please contact us.